Regarding cancer, please know this: The two things a person can ingest that turns on cancer growth and will best guarantee its success are refined sugars and dairy. This week immediately after my father’s oncologists performed his best and unsuccessful fear based sales efforts of chemotherapy of which he would have earned a commission, someone from food services showed up with a milkshake for papa to consume. They add a powder protein to the other so it must be healthy no not really. There is a complete disconnect between the cancer industry I have experienced thus far and real nutrition or healing. Remission is mostly a temporal suppression of the evidence of cancer. Empowering the body to gain once again homeostasis along with creating the environment for the body to detoxify is considered healed. In every bite or sip we take, we are either nourishing or poisoning ourselves. There is much more to cover soon. 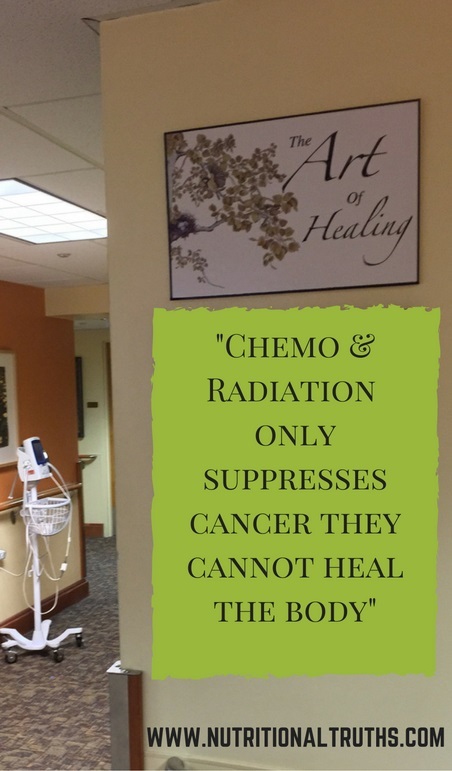 In the particular oncology hallway I visited several times this week, they advertise healing, but that is not the truth. Investigate further, have an amazing weekend and go love on those you love. Feel free to share and Be Well!